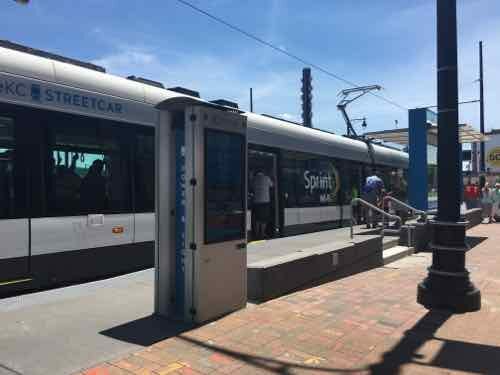 St. Louis Mayor Francis Slay has made clear his support for a north-south MetroLink expansion, saying it’s a top priority in his final year in office. 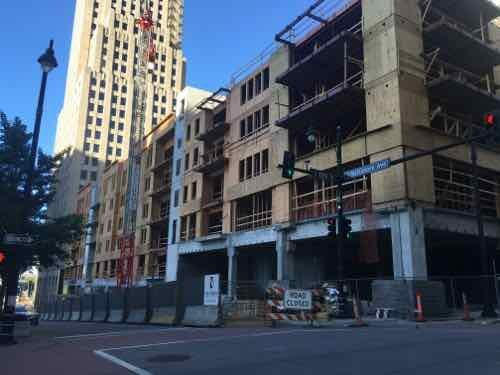 But a recent push for money to plan such a route has met with strong resistance from St. Louis County Executive Steve Stenger. 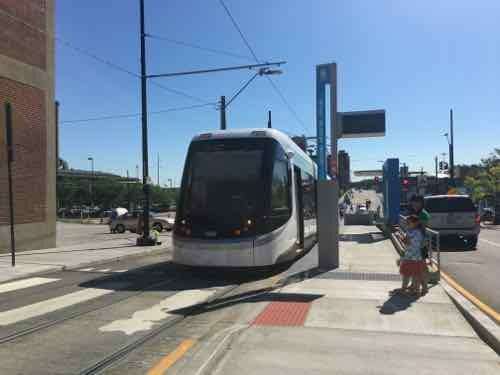 At the other end of the state, in Kansas City, there’s also a disagreement about the expansion of rail-based public transit. 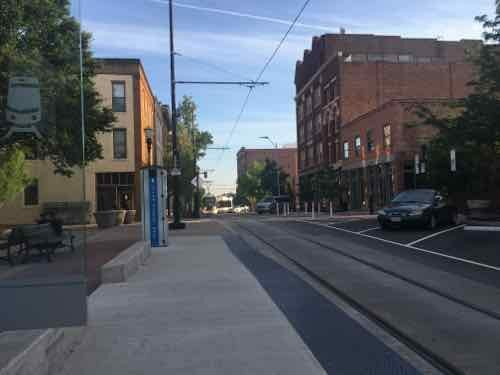 The local non-profit behind the new KC Streetcar wants to expand South on Main Street, while another is pushing a light rail plan. 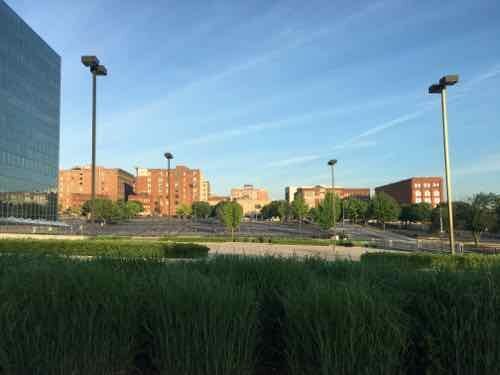 [Clay] Chastain argues his plan gives Kansas City residents a real choice and a much more extensive rail transit system, from the airport to the Cerner Trails campus under construction in south Kansas City and from Union Station to the stadium complex. 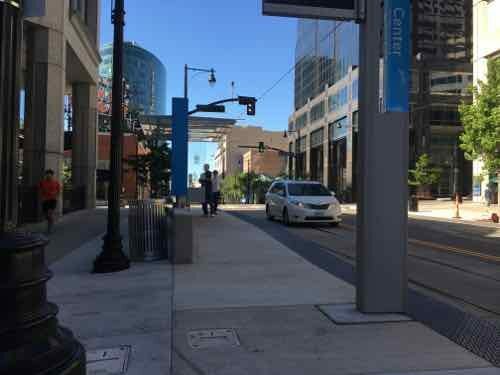 He estimates it would cost $2 billion to build, or about $45 million per mile, although some light-rail systems have cost considerably more than that per mile. He assumes the federal government would provide $1 billion of that amount. Anyone who has flown in/out of KC’s airport knows it is a long distance from downtown KC. It’s a 20-25 minute drive, but takes over an hour by bus. 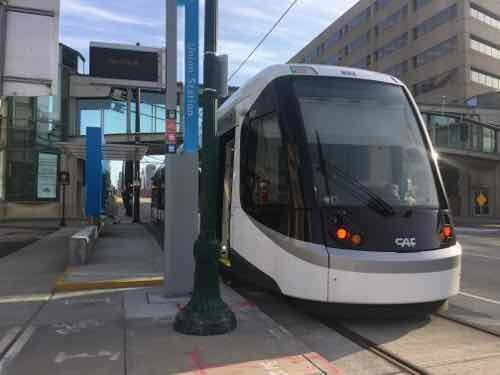 Frankly, they need to do both — expand the new streetcar and build light rail to far off destinations like their airport and stadiums. 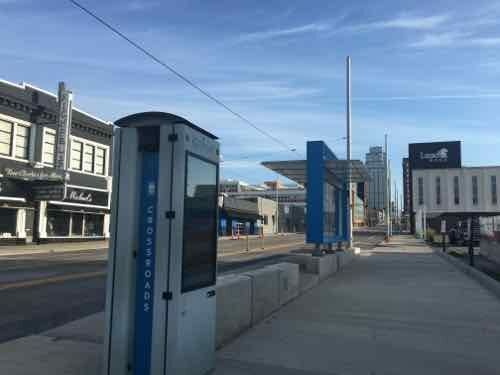 Kansas City was without rail-based public transit from 1957 until May 6, 2016 — the day the 2.2 mile starter streetcar opened. 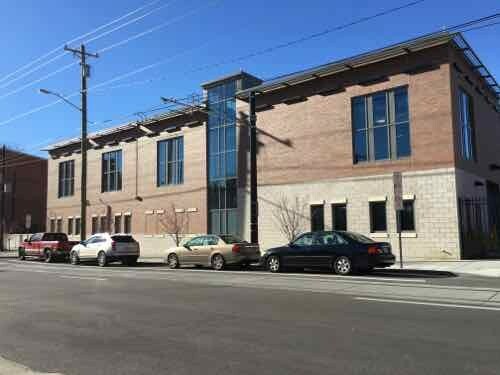 Cost to build: $100 million — $37 million from the federal government, $63 million from bonds. Cost to operate: $4 million annually to be paid by a combination of sales & property taxes within the transportation district. 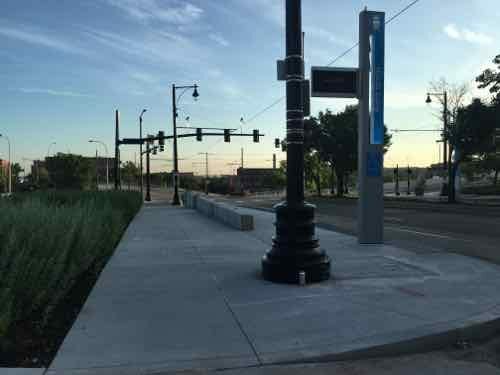 Local comparison: Our Loop Trolley vintage streetcar project. also 2.2 miles long, is costing $51 million to build. 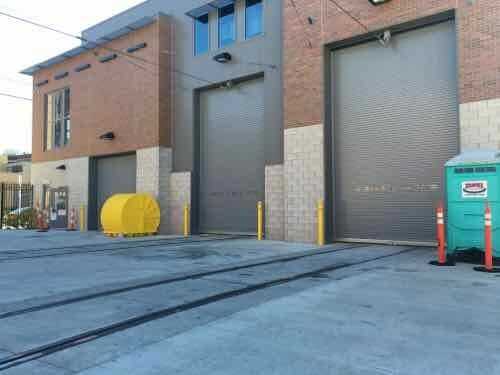 The 8-mile cross-county MetroLink extension that opened in 2006 cost $430 million. Each of the four vehicles cost $4.39 million each (source). 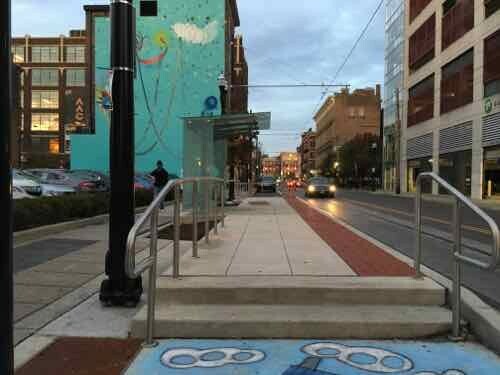 Same as vehicles used in the Cincinnati Streetcar opening later this year. Manufactured in Elmira NY by CAF USA, a subsidiary of a Spanish company. The lights change depending upon direction of travel. The step on this end of the Union Station platform is annoying. The center car has two areas with theater seats. My wheelchair fit here and my husband could sit on one seat. 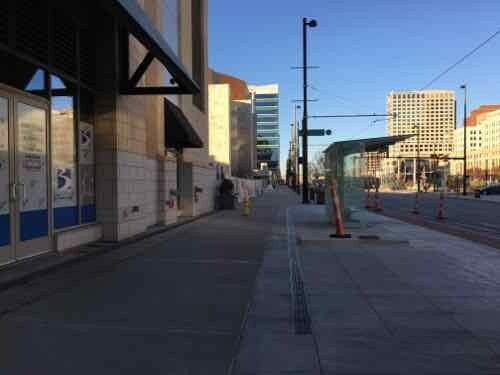 Kansas City is lucky to have Main Street as a central arterial. We have Olive/Lindell, but they’re very different. 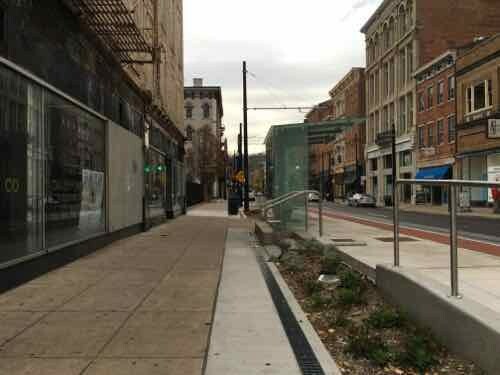 The 2.2 mile route does a loop on the North end around their River Market area. It goes down Main and ends at Union Station. 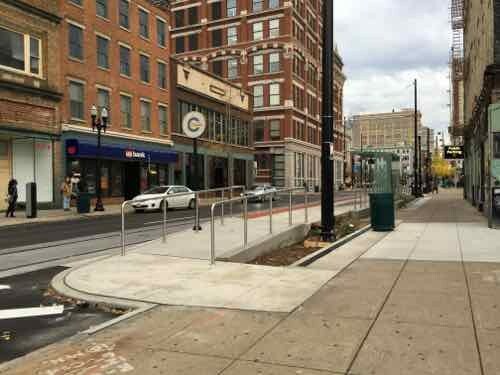 An extension to continue South on Main Street is already being planned. 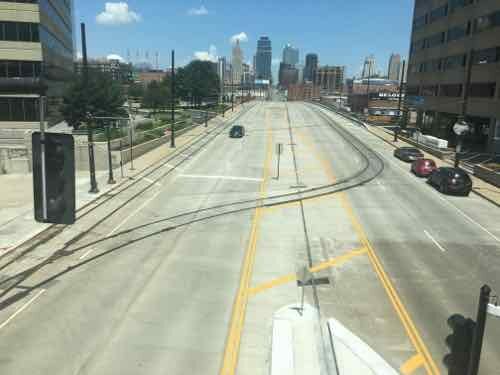 Looking North on Main St toward Downtown Kansas City. See a route map here. Stops are every few blocks, over the 3-day weekend I rode the streetcar a few times but also traveled the route on the sidewalk. For the most part. 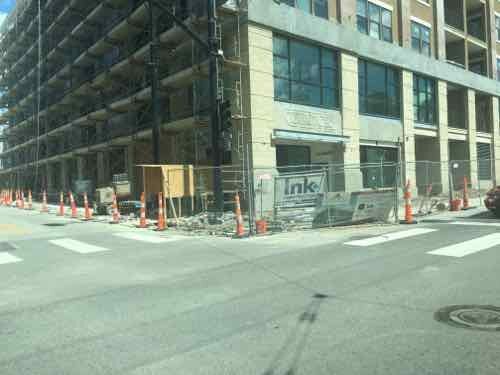 the stops are built out into the parking lane — leaving the sidewalk unblocked. 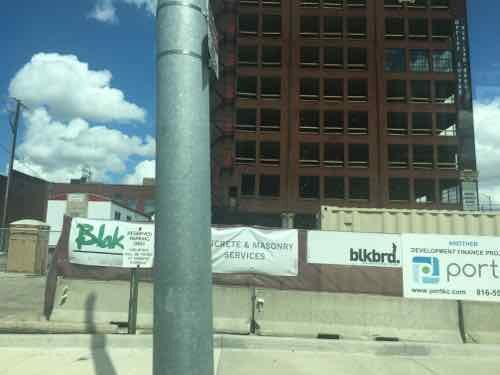 New construction is everywhere in Kansas City, especially near the streetcar route. 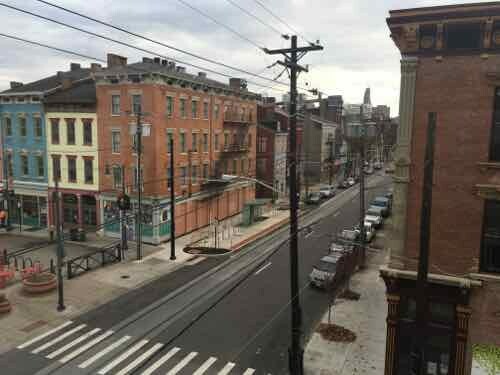 Their streetcar isn’t meant to be a regional system, at least not initially. 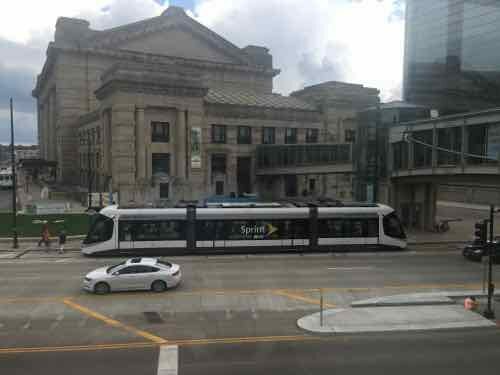 CAF makes very similar vehicles for use in higher-speed light rail applications, so if they ever do a light rail line the vehicles could look just like their streetcar. 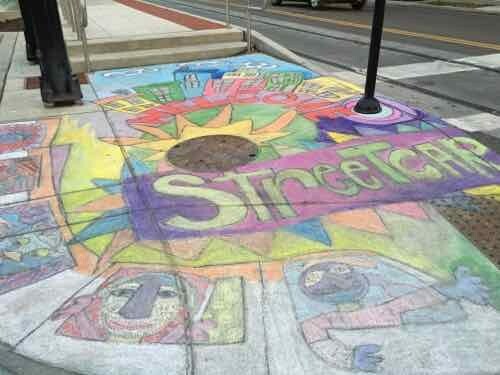 Being right there it helped add life to the street. It’ll be interesting to see if they’ll be able to expand. 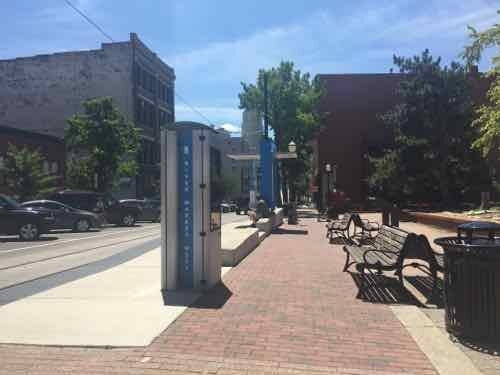 Metro St. Louis is busy working on smart cards for paying transit fares, some have been testing the new technology. Meanwhile, we’ve been using the Ventra smart card for nearly 2 years when visiting Chicago. 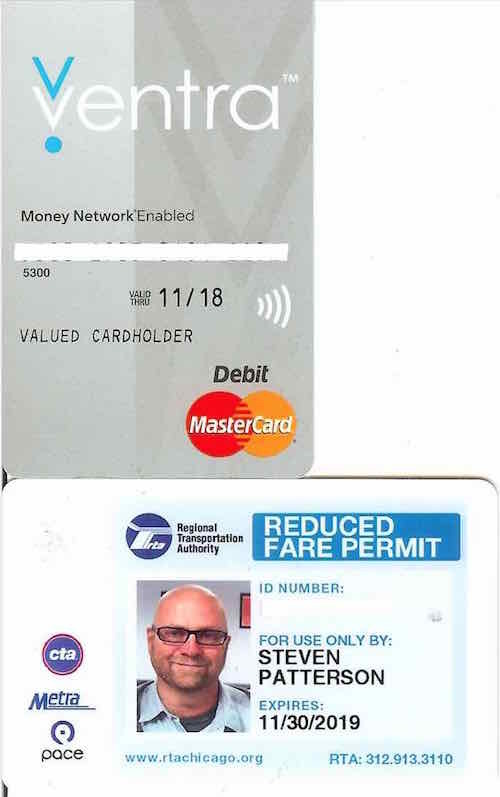 See Contactless Transit Smart Cards from February 2014. Last month I finally decided to apply for a reduced fare card. Both cards are now on one online account, allowing me to login to add value. My husband will use the full fare while I use the reduced fare with my picture. I applied in person in Chicago and the card was mailed to me in about a week. Both are “contactless” which means the user just taps it at the reader, both have a magnetic strip on the back. The same card works for all three Chicagoland systems: CTA, Metra, & Pace. It doesn’t appear my new reduced fare card can be used as a debit card — that won’t matter to me but it might to others. 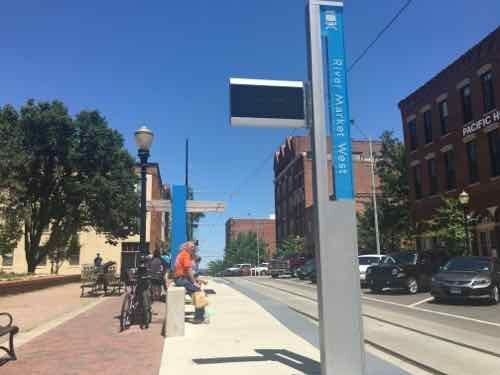 In St. Louis, our Metro isn’t going to have a debit card connection — deemed too costly. I’m told existing reduced fare ID holders like myself will automatically receive a new reduced fare smart card — once ready. New applicants will apply in person but leave with the card rather than have it mailed. Since my current Metro reduced fare ID expires in February 2016 I’ll need to renew it once more before I get a smart card version. 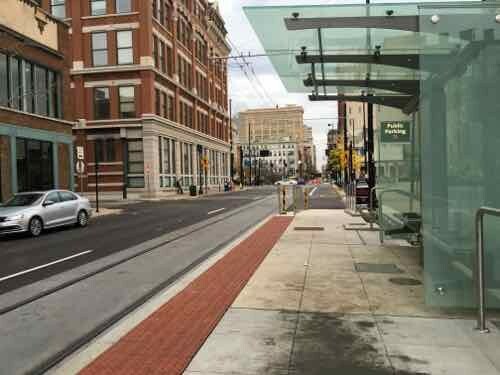 Last month I visited Cleveland to check out the best Bus Rapid Transit (BRT) route in the country, see Cleveland’s Healthline Bus Rapid Transit (BRT), Part 4. Earlier this month I was back in Ohio, this time in Cincinnati. 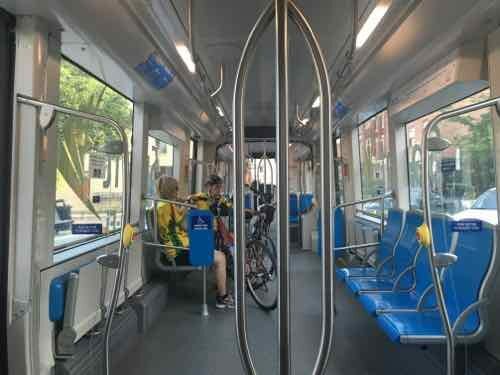 During my 3-day visit for a Streetsblog meeting we checked out the upcoming Cincinnati Streetcar. Expected to be operational by the end of September 2016, the tracks, overhead wires, & platforms are all in place. The platform here is little more than the sidewalk. 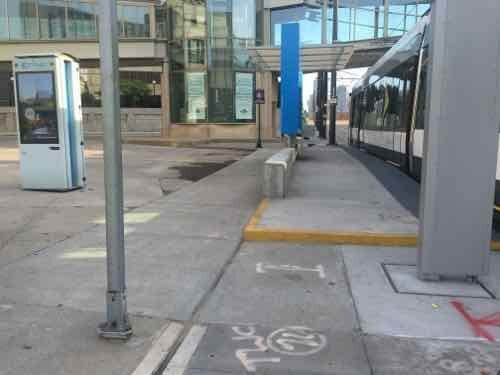 The platforms, built within the parking lane, are higher than the sidewalk to allow for level boarding. Same platform from the other direction. This platform had ramps at both ends, some only have one ramp. 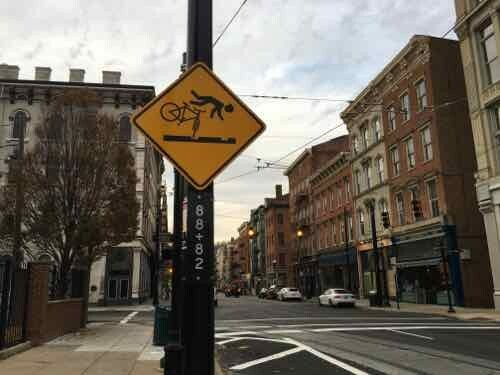 Warning signs are up to alert cyclists to the danger of the tracks. 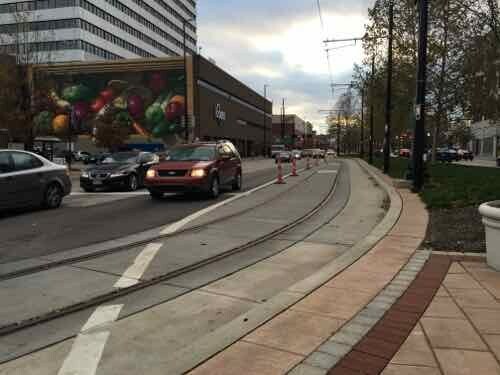 Looking West on Central Parkway from Walnut, the streetcar track cut into the median to make the turn into the near land on Walnut. 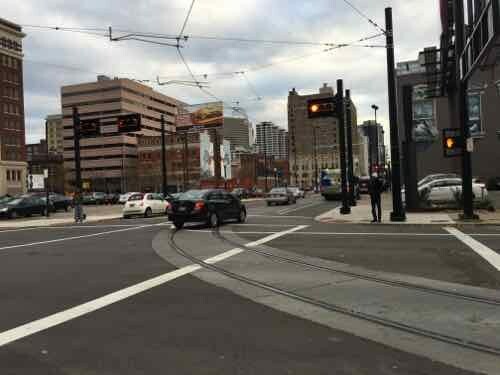 At numerous intersections cameras are able to detect the streetcar, causing the traffic signals to go into a special mode to stop all traffic — in this case allowing the streetcar to turn right across several lanes of traffic. 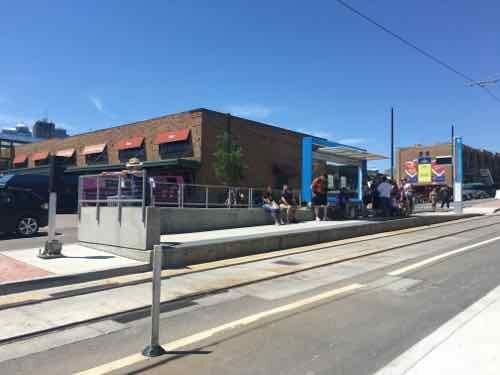 This platform on Elm @ Elder is next to Findlay public market, 1.5 miles from The Banks. 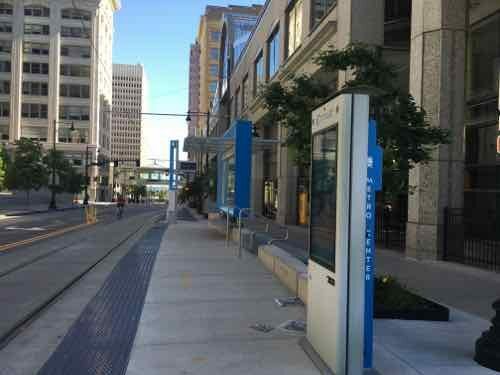 The streetcar will connect these points and everything in between. The maintenance facility is a new structure. 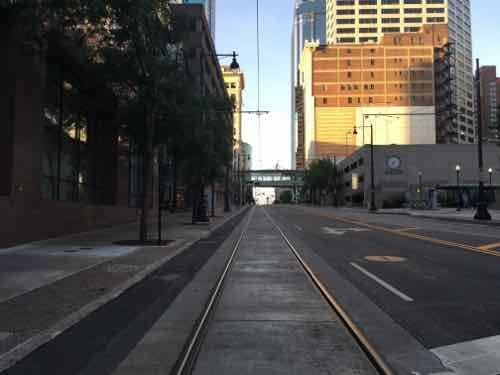 Their streetcar will run north-south on their grid of streets. Where we’ve butchered our grid, theirs remains largely intact, albeit mostly one-way couplets. 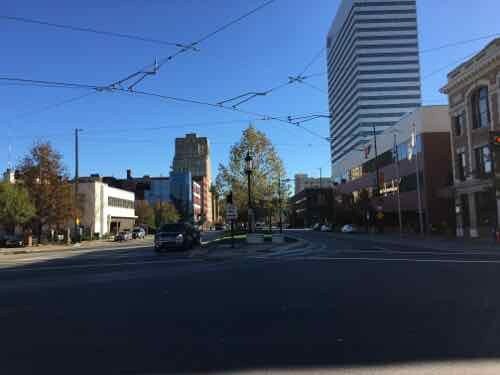 I traveled over a mile on each of four parallel streets: Elm, Race, Vine, & Walnut. 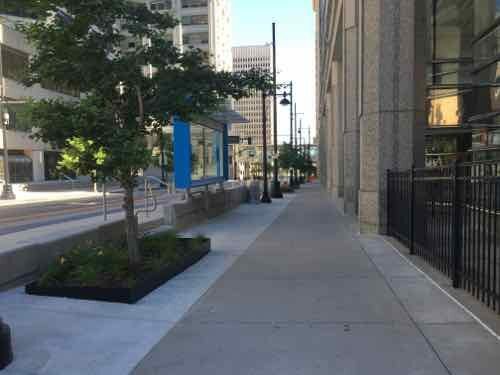 Their rights-of-way are also much narrower than ours are now — they didn’t have someone like our Harland Bartholomew aggressively widening streets by forcibly taking the front bay of buildings. What we call a trolley or streetcar, Europeans call a tram. Same thing, different name. 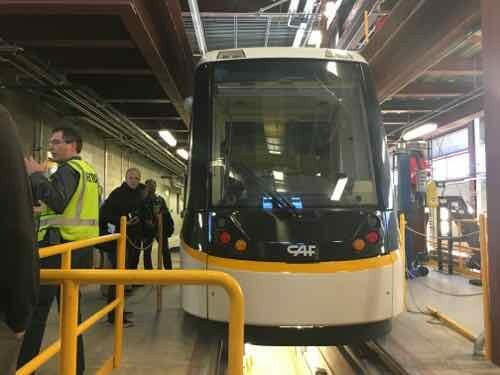 The vehicles are CAF Urbos 3, which are 100% low floor. 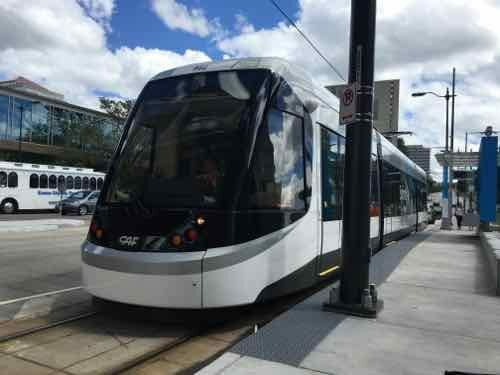 If Cincinnati decides to do a light rail line out to the suburbs in the future they can use the same vehicles. 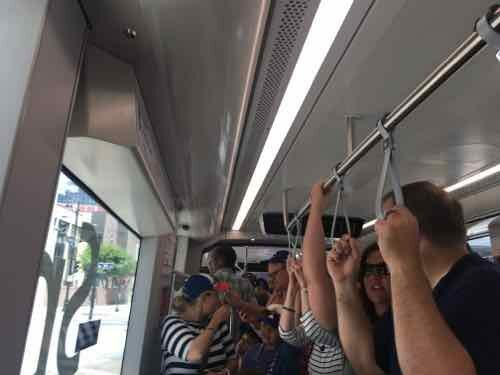 Yes, modern streetcars use the same vehicles as light rail. The difference comes in how the route is designed. 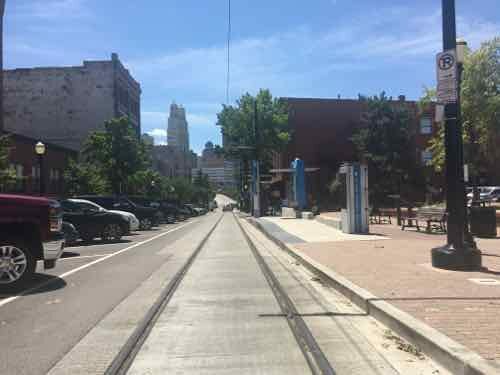 Kansas City is using the same vehicle for their streetcar line, which will also open next Fall. 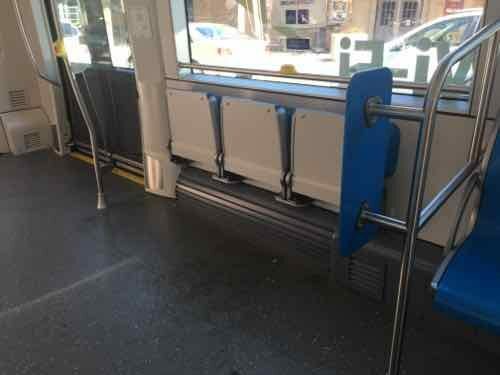 If we do street-running light rail, or a streetcar, these would be in consideration. To meet requirements for federal projects, they have at least 60% US content. 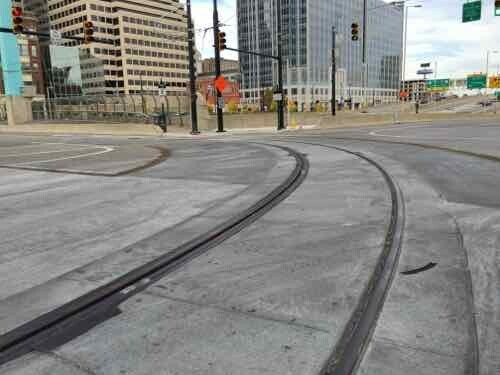 Like most cities, Cincinnati had streetcars in the 19th century, a subway was started but abandoned. 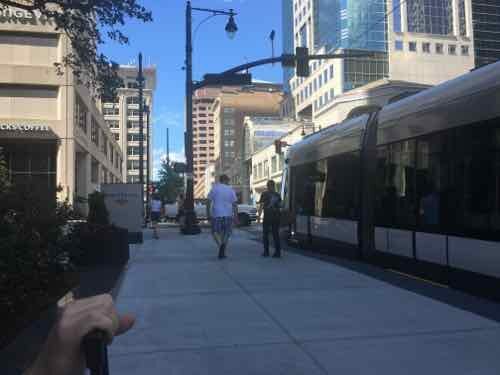 Cincinnati hasn’t had rail transit in decades. See their official stteetcar page here. 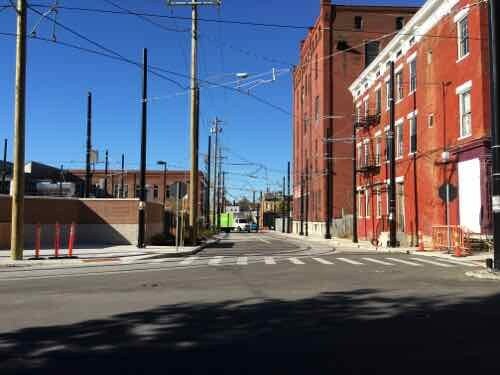 In January the Streetsblog network expanded into new areas, including a Streetsblog St. Louis. 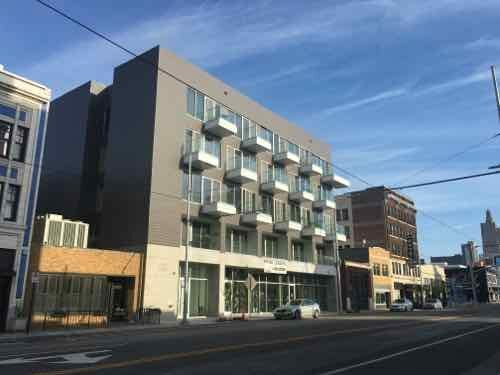 In April many of us gathered in Dallas to discuss urban blogging, followed by the 23rd Congress for the New Urbanism conference. Later this week we’ll meet again, this time in Cincinnati. Three weeks after taking Megabus to Cleveland via Chicago I’ll be back on Megabus to Chicago and across Indiana into Ohio. I’ve driven past Cincinnati several times over the years, but I’ve never stopped. Like many my age, I grew up watching WKRP in Cincinnati. To this pre-teen, in Oklahoma City, Cincinnati looked more like what I thought a city should be — based solely on the show’s opening sequence. With Thanksgiving coming up I had to include a clip from a classic episode.